Thomas Townsend Brown, better known as T. Townsend Brown, filed to patent his Electrokinetic Apparatus in 1957. Patent US2,949,550 was granted in 1960. 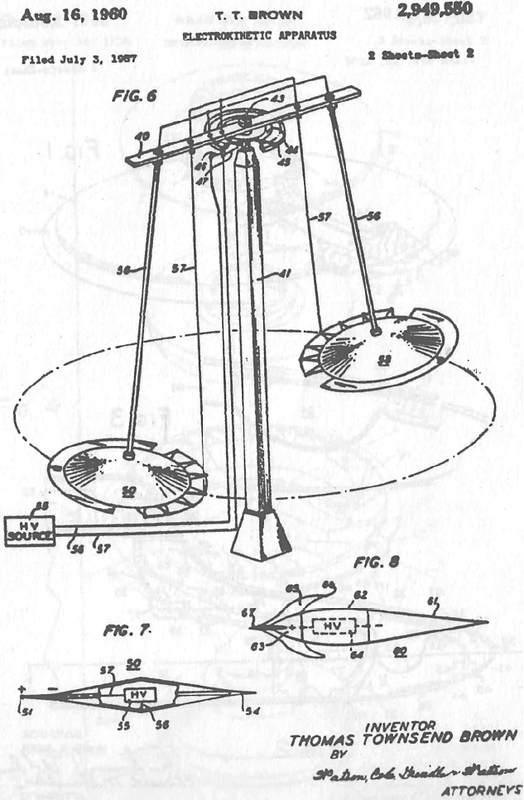 Brown's saucer-shaped Electrokinetic Apparatus was an anti-gravity device containing no moving parts which was capable of amazing speeds. In 1963, a corporation named Raytheon -- best known for its multitudinous War Crimes -- patented a similar device (US3114517A). Brown held several patents related to energy and gravity, and worked on a number of US military projects throughout his lifetime, mostly as a consultant. Thomas Townsend Brown died in 1985.